I believe most of us at some point in our lives are curious about and try to discover, the common thread of our life experiences and why it developed in us. With close examination we can reveal the motivator which connects our life passions and helped us grow and achieve great things. For me this motivator was my mother, Helen, who from my early years established my lifelong eagerness for understanding the core of optimal health, nutrition, beauty and inner peace, all within the context of using my knowledge to empower others to be their best. She was in 1960’s parlance a “health nut,” following early nutrition pioneers such as Dr. Carlton Frederricks. She was fascinated by the world and energized me to obtain a B.A. in History from Adelphi University. Increasingly I focused my attention on the politics of food and agriculture policy and received a B.S. in Nutritional Science from Cornell University. Keeping in mind my mother’s lesson of using knowledge to empower others, I directed The Community Food and Nutrition Program in Ithaca, New York. It provided residents of Tompkins County with nutrition education, food buying clubs, community gardens and food resources and established the Woman, Infants and Children and the Summer Food Programs. I authored many successful grants proposals for nutrition and agriculture programs. In 1974 I became a vegetarian and co-authored Eating for Life, an early primer on the benefits of a vegetarian diet. I have lectured nationally on the benefits of a vegetarian diet and have taught at Cornell University. I have been involved in many aspects of the food and agriculture industry. For over 17 years I worked in the wholesale food distribution industry for companies such as SYSCO, functioning as their specialty and international food coordinator. Living in Ithaca for 31 years I increasingly missed the sun and often vacationed in Key West Florida. Around 1900 Ithaca was the one of the major centers of childhood rickets in the United States due to the lack of sunshine. In 2010 I picked up my life and moved to Key West! It was always my favorite vacation spot with its lively arts-packed cultural environment and sunshine. I was always fascinated by science, so when a friend who owns a spa told me about electrolysis I was intrigued. After having some treatments myself I decided to go to electrolysis school. 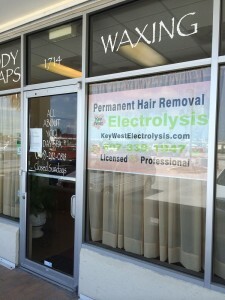 I graduated from the Sharon Verbanic-Smith Electrolysis Institute in 2010 and opened my own practice in Key West shortly after. I am now part of the team at the Tranquility Spa in Key West, and am providing high quality, life-changing treatment to many satisfied clients. Perhaps I have come full circle. My mother was a professional nail technician at a spa. I enjoy playing bocce. Key West has the largest per capita bocce league in the United States and I love the game. I have played in tournaments throughout the country and have competed well in the USBF championships in California. I enjoy beach volleyball, snorkeling, and bicycling. In 1978 I bicycled across the United States, the length, not the width! I am a certified United States Coast Guard HAZWOPER and can be called on to assist them in environmental emergencies. I am a member of The League of Women Voters and use my past employment with the Tompkins County, NY, Board Of Elections as a supervisor of voting machine programmers to assist the Monroe County Board Of Elections on election day. I attend the Key West Literary Seminar in January. This is a great group of truly fascinating people! My love of food and nutrition continues in Key West as I attend as many of our food festivals as I can. My volunteer work with the Waterfront Playhouse includes coordinating the food and beverage service aspect of their social events. I will assist you in achieving beauty goals you may have thought impossible. You will marvel at the new you.